OHMYGOD, My first experience with fried green tomatoes. I could literally eat the picture. 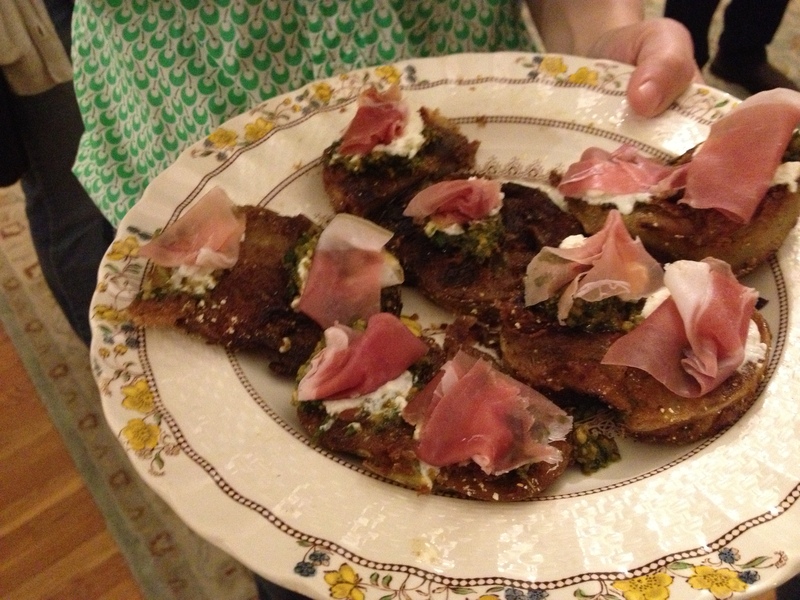 These had goat cheese and prosciutto, but I also had some with fat cloves of baked garlic on them. Yeah, I was the one at the party with the great breath. It’s sort of embarrassing to admit that until Saturday night I was a fried green tomatoes virgin. This is a tragedy of epic proportion. Once I tasted those flavorful tomatoes, I knew this dish would now be on my list of The Top Ten Foods I Want in My Mouth at the Time of Death. My friend and old neighbor Emma had a party and she made the tomatoes with another friend John, and what did I do, I just kept eating them. It was like when I was a kid and my mom used to make the eggplant for eggplant parmigiana, and I would eat those lightly breaded and fried brown circles so fast, she could never get enough to make the actual parm. Anyway, that’s how I was. A ravenously rude guest hogging the tomatoes. I’m guessing I won’t be asked back anytime soon. 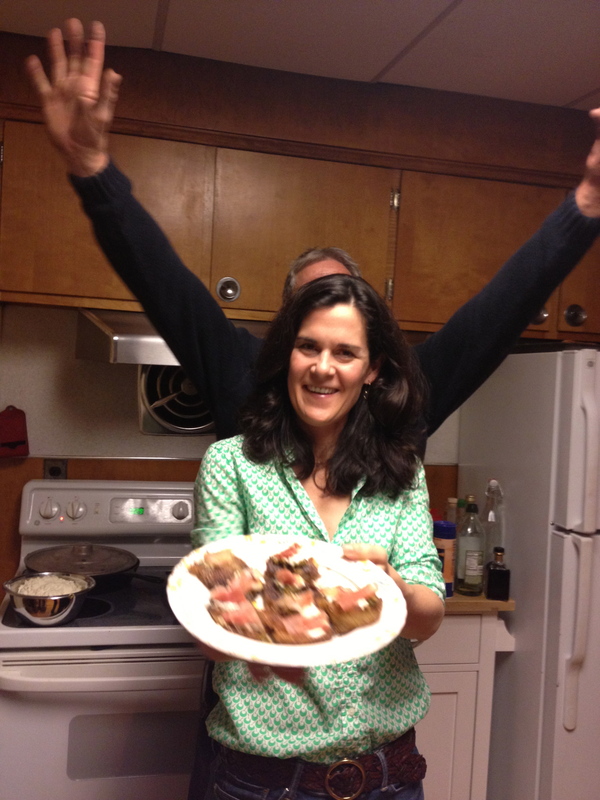 This is my friend and former neighbor Emma, and behind her John, who hates his picture taken. They were the head chefs who captained my fried green tomatoes maiden voyage. Thanks, guys! So, if you’ve only seen the movie, Fried Green Tomatoes, give the real thing a go. We are talking intensely flavorful gratitude. Fried okra is even better! yeah, like maybe you could MAKE IT FOR YOUR FRIEND TONI?????? My late grandmother couldn’t fry eggplant fast enough either when I was a youngster. If you want to try something else fun, try drained, fried dill pickle slices topped with grated Parmesan cheese. Just ran across your blog the other week. I really enjoy it and love the topic! thanks for reading. and thanks for pickle idea. my daughter is a pickle maniac! I luvs me some fried green tamaters! Something else to do with all those unripened fruits this time of year if you never got the recipe for that great dipping spread (solitude?) you have spoken about. not really, but i’ll try and get it later today. i was thinking of doing it again, but it’s a lot of work. but it is soooooo worth it!